Have you had enough of looking for utility trailer plans online? Good, you came to the right place then. If you are looking for easy to build, easy to follow, and easy to afford sets of utility trailer plans plus over an hour of video, keep reading. Do you really feel like spending $1300 for a utility trailer you could have built for $600 less? Why not just build your own and save hundreds of dollars and have the ability to customize it the way you intend to use it. This is one of the best, cheapest, and easiest welding projects you can do. When you get done just reading through the plans and watching the videos, you will know exactly how to build a utility trailer. There is a pretty good chance that you already have the tools as well as the skills to build one. Now you just need a good set of utility trailer plans to go with them. Both sets of utility trailer plans were designed and created in the same easy to follow, easy to master, way that all my other plans are designed. Here is my website for car rotisserie plans if you want to see how nice they are as well. 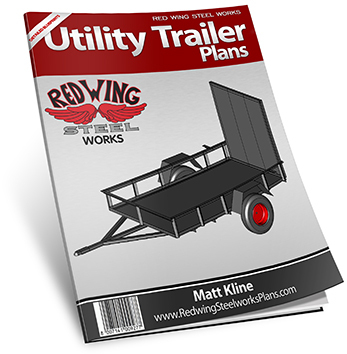 If you run a search for utility trailer plans on Google, you will see for yourself that no other website’s plans have 32 pages (per set of plans) of information to give you. You will be lucky to get 5 pages with all of the information crammed together making it hard to read and follow. Not to mention having to basically be an engineer just to understand them. That is surely not the case with these sets of plans. I designed them based on common sense and in an easy to follow way that anyone can understand. Besides, where else are you going to find 2 sets of utility trailer plans plus a “how to” video for free? The trailer that you will build is a 5′ x 8′ or 6′ x 10′ utility trailer with a hinged tailgate, full side rails, heavy duty frame and hitch, as well as a heavy duty axle. The trailer plans leave plenty of room for customization. Once you get rolling on this project, you will see for yourself how easy the design changes and customization can be. Even if you decide to follow the trailer dimensions and design to the letter, you will have a very nice and solid utility trailer when you are finished. The plans also come with a complete material list as well as a full cut list so there won’t be any second guessing when you need material. I have 2 different sizes of utility trailer plans available. 5′ x 8′ and 6′ x 10′. Each one is a 32 page PDF file that can be printed out so you can take the plans out to the garage and start building your trailer. I would encourage everyone to watch the free videos that give step by step instructions for building the exact utility trailer that is in the plans.